Lisa Marie Presley ornate framed photograph print on a 30 single men's tee. 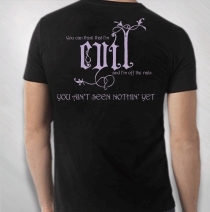 "You can think that I'm Evil...." lyric back. Soft hand print.